Maybe you want to add some scenic dorm wall art in your college dorm room, but don't want a city view. Maybe you want something a little different and unique to complete your college dorm room decor. Just because dorm room posters are basic college supplies, it doesn't mean that your dorm room decorations can't be one of a kind! Our Flying High Dorm Room Poster is a beautiful ocean view that will add room brightening college wall decor to your dorm room and complete a beach themed dorm room decor style! This dorm essentials dorm item features a unique scenic view. The scenic view in this dorm necessities item is taken in the ocean! 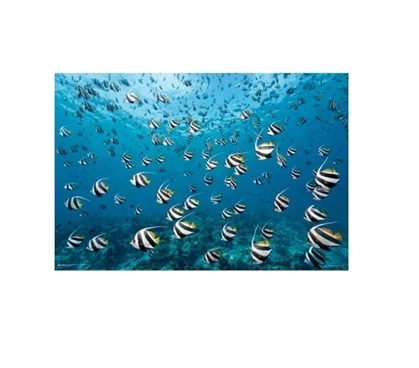 Our Flying High Poster for Dorm Rooms is a must have dorm item that features plenty of black and white fish swimming and fill up this dorm wall art item as far as you can see. Along the bottom of this cool poster for dorm rooms is the ocean floor and the water is a beautiful, bright aqua color. Along the top center of this dorm poster is a section of the water that is a light blue from the light coming through. This college poster is a must have dorm item that will add an amazingly beautiful touch of aqua to your dorm room decor!